A nice volcano located in the northern part of Ecuador. At the foot we encounter Indian villages, tilled lands and the San Pablo Lake. Close to the summit there is a rocky section, but it is not a technical climb. 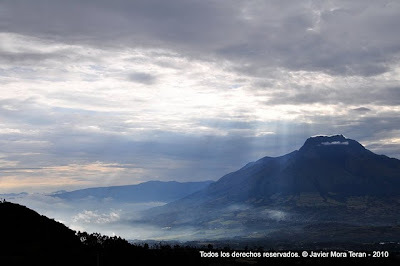 You can climb the Imbabura during one day if you are based in the Otavalo or Ibarra area. Nice volcano with no snow. Nice views to the landscape, Indian villages, volcano Cotacachi and the San Pablo Lake. There is a well marked path to the summit. Accommodation in either in Ibarra, Otavalo or at the foot of Imbabura, La Esperanza. Estimated climbing hours: 5h. Ascent, 3h. Descent to La Esperanza.